In Summer 2008, Addy made his first international move to Europe, from a Ghanaian Club – International Allies FC being signed by Danish SAS Ligaen club Randers FC. At Randers FC, Addy made his debut on 19 October against Vejle gaining 7 minutes. In the following season, Addy was part of the Randers FC squad that went to compete in the UEFA Europa League.He also made his debut in the UEFA Europa League, in the first qualifying round against Linfield FC from Northern Ireland on 2 July 2009. On 1 February 2010 the Ghanaian U-20 champion joined Portuguese top club FC Porto from SAS Ligaen side Randers FC for €800,000, signing a three ½ year contract. The young Ghanaian U-20 made his debut for FC Porto on 14 April 2010 in a 4–0 Victory against Rio Ave FC. In July 2010, he joined Académica de Coimbra on a season-long loan from Portuguese club FC Porto. On 31 August 2011, he joined a newly promoted Greek Superleague side Panetolikos F.C. on a season-long loan from Porto. On 30 September 2012, Addy signed a two-year deal for Vitoria S.C.. In May 2013 Addy helped Vitoria S.C. win the 2012/13 Taca de Portugal and qualified for the 2013/14 UEFA Europa League. Addy had 4 successful UEFA Europa League appearances against Real Betis, Olympic Lyon and Rijeka. Vitoria S.C finished third in Group I and made an early exit from the competition. In August 2014 Addy signed a 2-year deal with Belgian Pro League club Waasland-Beveren. 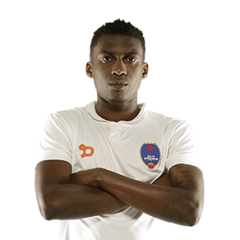 On 18 November 2016, Addy played his first match for Dynamos in the ISL on the left side of attack. In March 2017, Addy, left without a contract with Dynamos, signed a 3-month deal with Finnish club Rovaniemen Palloseura where he appeared in all of the 15 league games before leaving the team at the end of June. Addy earned his first Black Satellites call-up after an impressive performance with the Local Black Stars in 2008, making his debut in January 2008 in a match against Angola. In 2009 Addy was part of the squad that won the 2009 African Youth Championship. His success continued in October 2009 as he also took part in the 2009 FIFA U-20 World Cup held in Egypt which the team went on to win, making them the first African Nation to have ever won the 2009 FIFA U-20 World Cup. He was called up for the Black Stars for the game versus Lesotho on 8 June 2008. His second game was on 2 November 2008 against Niger. Addy has been called up to play for the Ghanaian Senior National Football team.